Page Jump: ========== 1 - Blade-y hell, it's thin 2 - More than just a pretty screen? Mainstream computer monitors in 2012 tend to ship with full-HD, 1,920x1,080-resolution panels usually contained within 22-24in screens. Available for £80 at the budget end and rising to over £300 for the all-singing, all-dancing models, there's a monitor for practically every budget. But you needn't spend a fortune in the search for a high-quality display. Cheaper monitors tend to use Twisted Nematic-type (TN) panels. These excel at fast-paced gaming due to quick response times, but as you saw in a recent Iiyama review, TN screens have very limited viewing angles and can exhibit sub-standard colour reproduction. Spend a little more and monitors with In-Plane Switching (IPS) technology dominate the market, where colour fidelity is a marked improvement over TN screens. Last but not least, a third type of panel, known as Multi-Domain Vertical Alignment (MVA), attempts to marry the best bits of TN and IPS into one screen. Philips lists no fewer than 60 monitors on its consumer site, so making an informed choice isn't easy, especially when the same-sized monitors are equipped with different panel technology. Launched recently as a do-it-all screen at a £175 price point, the 23in, IPS-powered Blade 2 has caught my eye. 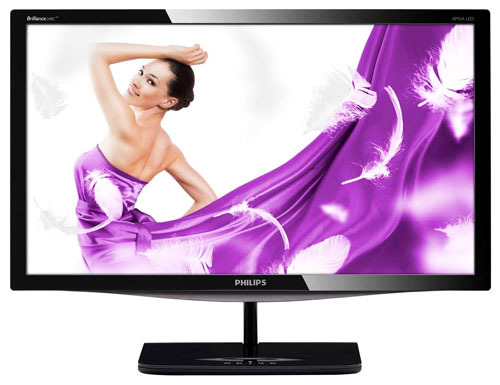 Now, however, Philips is outing the 24in version of the same model. Surely an extra inch doesn't make a lot of difference, you would think? The 24in Brilliance 249C4QH Blade 2, tentatively priced at £200-plus, isn't just a slightly larger version of the incumbent. Though there is little technical reason for not continuing with the IPS screen on the 23in version, which makes implicit sense, Philips takes the opportunity to equip the larger Blade 2 with an A-MVA panel. Outwardly, the two Blade 2s are near-as identical in appearance, and while not cutting a razor-sharp profile as the name suggests, the monitor section is less than half-inch thick. The thin, glossy bezel, high-quality finish, and accented bottom section provides a suitably premium look and feel, too. A thin profile leaves little room for the usual roster of connectors associated with a modern computer monitor. Instead, the Blade 2 has a pre-attached plastic base that simply locks into position; installation couldn't be any simpler. An obvious downside to a click-into-position stand is a lack of height adjustment, which is a feature I like to see on any monitor. The screen does tilt from -3° to +15°, by holding the base secure with one hand and pushing the screen backwards or forwards with the other. Laden with touch-sensitive controls on the front, two HDMI connectors on the back, a VGA port, along with an audio output on the side, Philips retains a certain sleekness by using an external power adapter. A DVI-equipped model - 249C4Q - is also available, with the DVI connector replacing both HDMI ports. The slim profile precludes speakers from being integrated into the casing, thus nullifying one of the main advantages of HDMI over DVI. Four base-mounted buttons control the image-quality settings. The menu system is intuitive and easy to use, providing enough information and configurability without being over-complicated. Change a setting and it's immediately shown on-screen, and the default shipping, out-of-the-box calibration is reasonable, albeit with brightness jacked all the way up to 100. Users can delve in further and choose one of several colour presets or manually configure the red, green, and blue settings. Philips touts of a couple of in-house settings that merit further exposition. 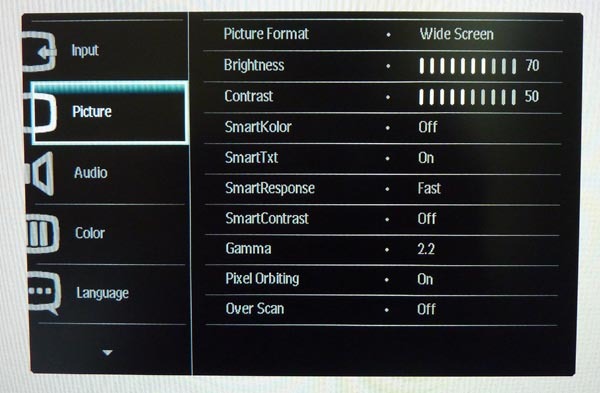 Specified with an average brightness of 250cd/m² and 5000:1 contrast ratio, the screen can boost the dynamic ratio to a claimed 20,000,000:1 under what's known as SmartContrast. Blade 2 also has a SmartImage mode that, the company claims, dynamically optimises the contrast, colour saturation and sharpness on-the-fly, depending upon just what kind of content is being viewed.